The best Gray Man yet. 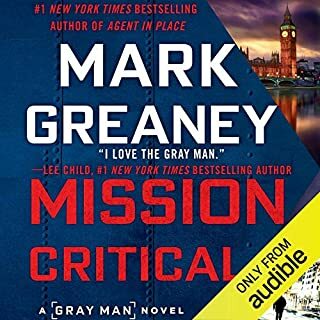 Mark Greaney takes the Gray Man to a whole new level of action and suspense in Mission Critical. The listener is never quite sure how things are going to turn out until the very end. It was nice to see some old characters come back. Mark left us with a lot of different directions the story can go from here. There is a lot of action in this story. It never gets dull. This one really made the miles pass fast. It gets my highest recommendation. For Kip Dawson, winning a passenger seat on American Space Adventure's first commercial spaceflight is a dream come true. One grand shot of insanity and he can return to earth fulfilled. It's a bittersweet moment of triumph, however, muted by his wife's terror over his accepting the prize. The day of the launch, Kip tries to reconcile his wife's and daughters' fears and even tries calling his estranged son, to no avail. He sets off, vowing to make amends upon his return. But a successful launch quickly morphs. Please make this into a movie!!! John Nance's books are all good. This book outshines all of the rest. It is difficult to say a great deal about what appeals to me without spoiling the book. The story picks up momentum as it moves on and will keep you entertained. We get to see a man make a choice to step out of his mundane life and take a chance with something he has always wanted to do. We have to listen to the book for is to see if that choice gets him killed. 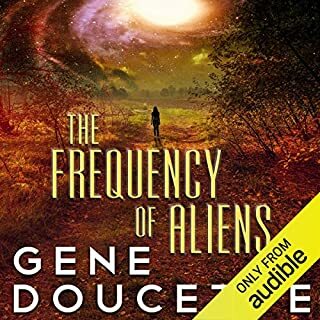 This audiobook is well written and well narrated. It will hold your attention all the way through and help the miles go by. This book gets my highest recommendation. This book kept me riveted all the through it. Cannot say enough about it. 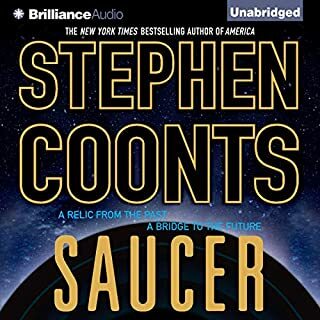 It is science fiction mixed with real people and a story that makes you want to keep driving rather than interrupt the book for a stop. The technical parts of the book got my mind running through possibilities and fantasies. The way the alien technology is handled does not cause one to choke on the story with any "Wait a second" moments. I highly recommend this book. It will make the miles fly by. The story begins on opening day of the NFL season, when bullets begin to rain down upon the upper deck of a packed football stadium. A panic stampede ensues, leading to mass casualties. The alleged sniper is found holding a smoking assault rifle, and is killed by a police marksman. One week later, Congress bans the private possession of all semi-automatic assault rifles. Gun owners are given one week to turn in their semi-automatic rifles, or face a five year mandatory sentence. This book had amazing promise. 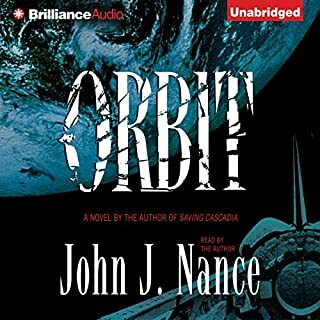 Alas the narrator's voice and style combined with the author's story telling and over use of adjectives made it so bad for me that I kept losing interest. Eventually it became so bad, that I just gave up. The Perfect blend of zombies and military action. 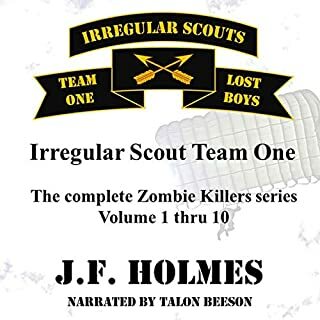 Whether you like military action or zombie stories, this one is right for you. If you like both, it is even better. I was never much on zombie tales, but I really like this one. The action is authentic and maintains believability in a post zombie universe. The characters grow on you as the story moves along. The story carries a good balance of action, drama, and even some laugh out loud moments. I never lost interest throughout the entire length of the series. The miles fly by in no time listening to this one. Annie Collins is back! Becoming an overnight celebrity at age 16 should have been a lot more fun. Not helping matters: she’s the only kid in school with her own pet spaceship. She would love it if things found some kind of normal, but as long as she has control of the most lethal - and only - interstellar vehicle in existence, that isn’t going to happen. Worse, things appear to be going in the other direction. 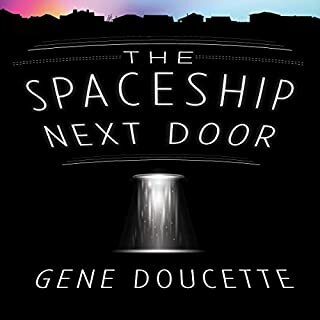 This is the sequel to The Spaceship Next Door. It drags just slightly in the middle, but still manages to hold the listener's attention. The conclusion will rivet you to your listening device. Once again the characters are engaging, warm and easy to relate to. Even through slow parts, this story keeps the reader engaged. It is a good way to make the miles go by quickly. This book tells of of a town with an alien spaceship parked just down the road. The spaceship landed and did nothing else. At least for a while. The story is original and not easy to out guess. There are surprises all the way through to the end. The characters are engaging and easy to relate to. It held my interest. It is a great way to pass the miles. 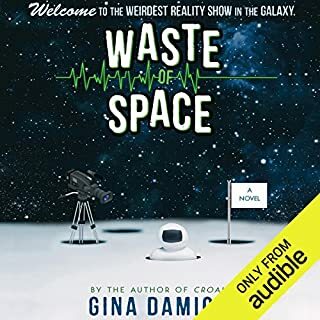 Cram 10 hormonal teens into a spaceship and blast off: that's the premise for the ill-conceived reality show Waste of Space. The kids who are cast know everything about drama - and nothing about the fact that the production is fake. Hidden in a desert warehouse, their spaceship replica is equipped with state-of-the-art special effects dreamed up by the scientists partnering with the shady cable network airing the show. This was not Ms. Damico's best work, but it was not her worse. There were some stretches that got a little dull. She desperately needs technical advice if she ever attempts to write about television production again. However, she nailed the personality of the show runner. I've worked with people just like she described. They probably would act exactly as Ms. Damico described were they not afraid of jail. That or figured out some way to make someone else take the fall. The premise of the story was ok. I like the concept of telling the tale through a whistleblower diary. She pushed the edges of believability and the laws of physics a bit far for my taste. I think she could have done more with the story. 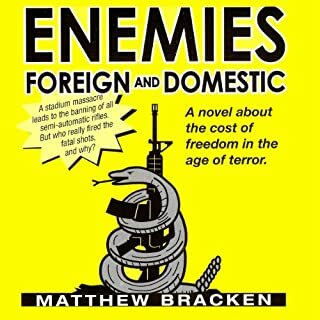 This quick little tale is a good mix of science fiction, legal fiction and corporate fiction. 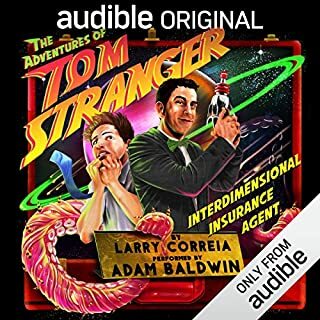 Competing "insurance agents" engaging in a full contact interstellar legal match is very entertaining. The twists and turns kept the listener guessing all the way through it. It made me laugh in a few places. It will hold your interest all the way through. I recommend it. People love easily. Look at most of your relatives or coworkers. How lovable are they? Really? Yet most have mates and children. The vast majority are still invited to family gatherings and their relatives will speak to them. Many have pets to which they are devoted. Some even call them their fur-babies. Is your dog or cat or parakeet property or family? Not in law but in your heart? Can a pet really love you back? Or is it a different affection? Are you not kind to those who feed and shelter you? But what if your dog could talk back? Would your cat speak to you kindly? 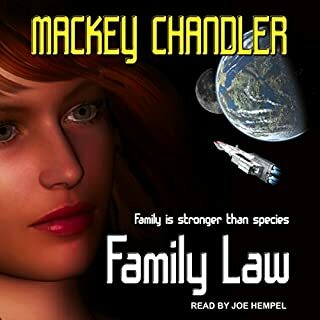 Mackey Chandler is an author I will be looking for. All four (so far) books in the series were very entertaining for me. Chandler's style perfectly blends detail, action and technical things for me. His Heinlein like observations on people, and in particular Earth based bureaucracies is refreshing. This book will keep the listener interested and entertained all the way through. It really made the miles go by fast. It is family friendly and I highly recommend it for everyone.